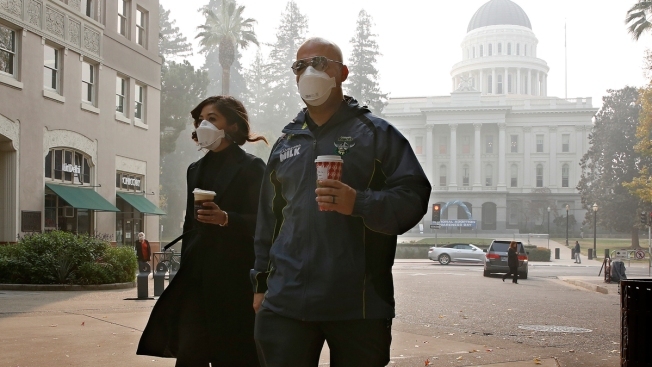 Mattelin Bautista and Stephen Penner don masks to deal with the smoke from the Camp Fire that shrouds the state Capitol Thursday, Nov. 15, 2018, in Sacramento, Calif. Smoke from the blaze that burned through the Butte County city of Paradise is creating a health hazard that experts say could lead to an increase in serious health problems, especially for children and the elderly. Smoke masks. Eye drops. No outdoor exercise. This is how Californians are trying to cope with wildfires choking the state, but experts say an increase in serious health problems may be almost inevitable for vulnerable residents as the disasters become more commonplace. Research suggests children, the elderly and those with existing health problems are most at risk. Short-term exposure to wildfire smoke can worsen existing asthma and lung disease, leading to emergency room treatment or hospitalization, studies have shown. Increases in doctor visits or hospital treatment for respiratory infections, bronchitis and pneumonia in otherwise healthy people also have been found during and after wildfires. Some studies also have found increases in ER visits for heart attacks and strokes in people with existing heart disease on heavy smoke days during previous California wildfires, echoing research on potential risks from urban air pollution. For most healthy people, exposure to wildfire smoke is just an annoyance, causing burning eyes, scratchy throats or chest discomfort that all disappear when the smoke clears. But doctors, scientists and public health officials are concerned that the changing face of wildfires will pose a much broader health hazard. "Wildfire season used to be June to late September. Now it seems to be happening all year round. We need to be adapting to that," Dr. Wayne Cascio, a U.S. Environmental Protection Agency cardiologist, said this week. In an overview published earlier this year, Cascio wrote that the increasing frequency of large wildland fires, urban expansion into wooded areas and an aging population are all increasing the number of people at risk for health problems from fires. Wood smoke contains some of the same toxic chemicals as urban air pollution, along with tiny particles of vapor and soot 30 times thinner than a human hair. These can infiltrate the bloodstream, potentially causing inflammation and blood vessel damage even in healthy people, research on urban air pollution has shown. Studies have linked heart attacks and cancer with long-term exposure to air pollution. Whether exposure to wildfire smoke carries the same risks is uncertain, and determining harm from smog versus wildfire smoke can be tricky, especially with wind-swept California wildfires spreading thick smoke hundreds of miles away into smoggy big cities. "That is the big question," said Dr. John Balmes, a University of California, San Francisco, professor of medicine who studies air pollution. "Very little is known about the long-term effects of wildfire smoke because it's hard to study populations years after a wildfire," Balmes said. Decreased lung function has been found in healthy firefighters during fire season. They tend to recover but federal legislation signed this year will establish a U.S. registry tracking firefighters and potential risks for various cancers, including lung cancer. Some previous studies suggested a risk. Balmes noted that increased lung cancer rates have been found in women in developing countries who spend every day cooking over wood fires. That kind of extreme exposure doesn't typically happen with wildfires, but experts worry about the kinds of health damage that may emerge for firefighters and residents with these blazes occurring so often. Whether that includes more cancer is unknown. "We're concerned about that," Balmes said. Regular folks breathing in all that smoke worry about the risks too. Smoke from the fire that decimated the Northern California city of Paradise darkened skies this week in San Francisco, nearly 200 miles southwest, and the air smelled "like you were camping," said Michael Northover, a contractor. He and his 14-year-old son have first-time sinus infections that Northover blames on the smoke. "We're all kind of feeling it," Northover said. The smoke was so thick in San Francisco, the skyline was barely visible from across the Bay. The city's iconic open-air cable cars that are popular with tourists were pulled off the streets Thursday because of the bad air. An Environmental Protection Agency website said air quality in Sacramento was "hazardous" Thursday and San Francisco's was "very unhealthy." Many people walking around the cities wore face masks. Most schools in San Francisco, Sacramento, Oakland and Folsom said they would be closed Friday. At least six universities in Northern California canceled classes Thursday. At Chico State University, 11 miles (18 kilometers) from Paradise, ash fell this week and classes were canceled until after Thanksgiving. "It's kind of freaky to see your whole town wearing air masks and trying to get out of smoke," said freshman Mason West, 18. "You can see the particles. Obviously, it's probably not good to be breathing that stuff in." West returned home this week to Santa Rosa, hard hit by last year's wine country fires, only to find it shrouded in smoke from the Paradise fire 100 miles (160 kilometers) away. West's family had to evacuate last year for a week, but their home was spared. "It's as bad here as it was in Chico," West said. "It almost feels like you just can't get away from it." Smoke has been so thick in Santa Rosa that researchers postponed a door-to-door survey there for a study of health effects of last year's fire. "We didn't feel we could justify our volunteer interns going knocking on doors when all the air quality alerts were saying stay indoors," said Irva Hertz-Picciotto, a public health researcher at the University of California, Davis. The study includes an online survey of households affected by last year's fire, with responses from about 6,000 people so far. Preliminary data show widespread respiratory problems, eye irritations, anxiety, depression and sleep problems around the time of the fire and months later. "Conventional thinking is that these effects related to fires are transient. It's not entirely clear that's the case," Hertz-Picciotto said. Researchers also will be analyzing cord blood and placentas collected from a few dozen women who were pregnant during the fire, seeking evidence of stress markers or exposure to smoke chemicals. They hope to continue the study for years, seeking evidence of long-term physical and emotional harms to fire evacuees and their children. Other studies have linked emotional stress in pregnant women to developmental problems in their children and "this was quite a stress," Hertz-Picciotto said. It's a kind of stress that many people need to prepare for as the climate warms and wildfires proliferate, she said. 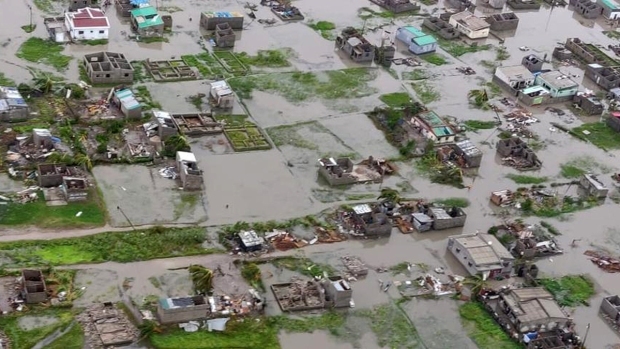 "Any of us could wake up tomorrow and lose everything we own," she said. "It's pretty scary."